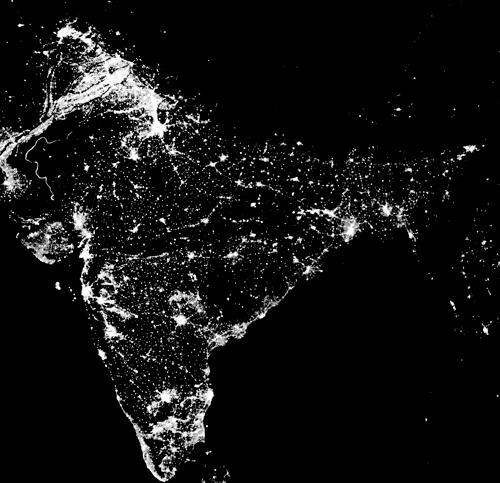 I was surprised to see India pretty well lit up and not looking too bad on the world slate. I now know why the BJPs India Shining political campaign did not work on terra firma – since it you can see this only from extremely high altitudes and politics is all about keeping your ear to the ground. To me Japan looks the brighest and USA a very close second. Africa is truly the dark continent. Given what is now being said about Nigeria and Ghana, I guess they’ll light up in the decades to come. South Africa, as expected stands out and so does the Nile channel in Egypt. Western Europe, is aglow with the prosperous lumens that dissipate quickly as one moves eastward eventually following the path of the Trans Siberian Railway. 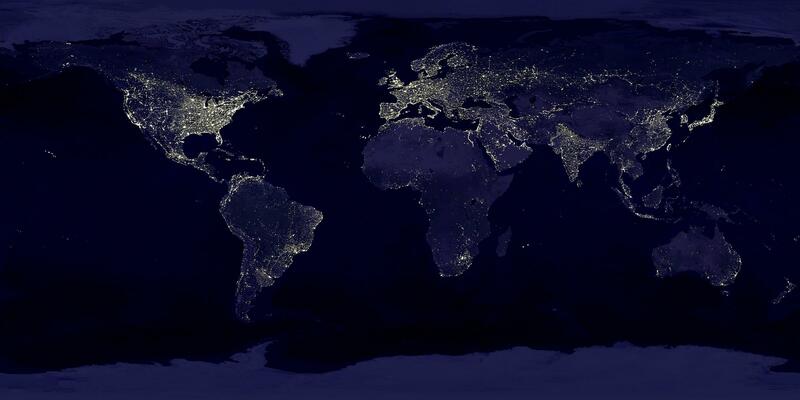 If the natural earth glow is filtered out, I’d have missed Australia completely. And finally, China is well lit on its eastern side. The fact that the eastern sides of largish land masses are better lit than the western side is striking. 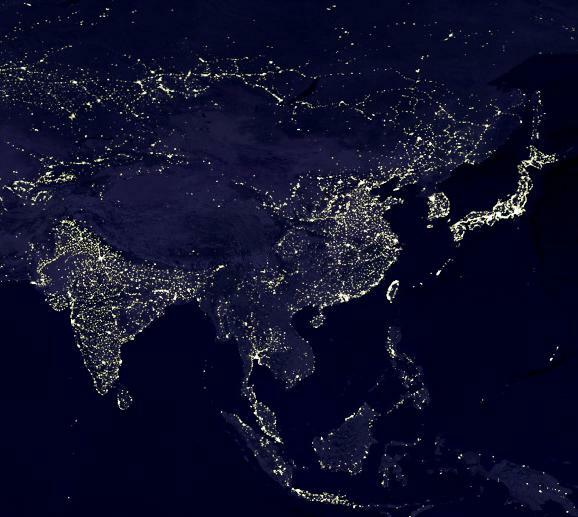 The US east coast, China’s eastern provinces, Australia, the African continent, South America, the sliver of light that is Japan, UK, the Meditteranean Coast – all have brighter eastern sides. Why? The exception seems to be India. Its east side is darker. From personal aerial experience I know for sure that Mumbai shines the brightest of all Indian cities. I guess it’s got to do with two factors – A) density of population in an area and B) the degree of urbanization. The latter is more important, I think since while Mumbai has the world’s largest slum, the slum lights will fade out if seen from such high an altitude. These are closely placed street lights (the streets lights in Hyderabad are not closely placed at all) and residential light fixtures. Highway lights again, would get too diffused, I think. But just take a look at the Indus basin. No wonder the rich alluvial soil and the 5 rivers spawned the Indus Valley Civilization 5000 years ago. The Punjab provinces (both Indian and Pakistani side) seem to be bathed in white! On the other hand, you just cannot make out the path of the Ganges at all. Beats me. Also, if you follow my eye, you can almost see the lights carving out the combined boundary of Maharashtra and Andhra Pradesh. Leaving out Orrisa, Chattisgarh, Madhya Pradesh and Jharkhand in the dark. It’s almost as if the previous two states had dotted light beacons along their perimeters. Is there a correlation between insurgency and electricity consumption? The problem of naxalism seems to be hitting states that are darker at night. And therein lies the answer – light up these areas and the arms that hold the guns will pick up laptops instead. Alas! If wishes were horses, beggars would ride – read my latest tweet on our Government crazy Robin Hood logic. Agreed, that the income disparity amongst states needs to be reduced. But don’t do this by making the richer states poorer! The New Delhi think tank is tackling the problem of runaway food inflation in the agrarian states of India (Punjab, West Bengal, etc.) by increasing the procurement price of food stuff. Their logic is if food prices are increasing (it’s c20% in these states), lets give more money to the farmers so that they can afford to buy more. How can you fight inflation by increasing prices? Leaving bumbling babus behind, I panned out to look at Asia and peg the two big neighbours against each other. The electricity consumption in India is quite less as compared to China. Now, while China has a much larger land mass, much of China is in its east. Also, the land masses of eastern China and India are almost equal in size. So what explains the fact that despite the higher consumption of electricity by China it does not appear brighter than India? China seems to consume 3,650 TWH of electrcity per annum (a neat 10 TWH per day!) as compared to just 568 TWH/yr for India. So, eastern China should appear 6 – 7 times as bright, right? I guess whats happening is that almost all of the incremental electricity (as compared to what India eats up) is being used to fire the foundries that line up the dragon’s belly. This article from China Daily sheds some light on the issue. Are the Chinese producing too much too soon. Maybe they should slow down. This sudden reading up on lights, lighting and night lights came about when I was contemplating a company called MIC Electronics – they’re the LED solutions company that’s lighting up stadia, streets, festival venues, the Commonwealth Games, village lanterns, railway coaches, airports etc. They’ve got a nice banner on their website and the spooky thing is that this company is also from Hyderabad! God knows whats wrong with me – Shakti Met Dor, Hyderabad Industries (contemplating) and now this! It’s a nice city ok, perhaps a bit sleepy but investing like this is crazy. I’ve taken up a small position in this company so that I don’t lose track of it and am reminded that I need to think more about it. I read a reseach report about it sometime back but as yet I am not fully convinced that it has the power to light up my portfolio. My first issue with this company is that it currently shows up at rank 33 when I search for “LED lighting india” in Google. Which is not that bad considering that A) they are largely B2B and that B) this website itself shows up at rank 58 in a google search on Kaushal! And no, I have not heard of search engine optimisation – but maybe the MIC guys have? Actually doesn’t matter since they largely sell to people like Indian Railways and other assorted organisations who don’t really need Google to find out about them. In his youth, Warren Buffett used to “dig into” people’s garbage bags to find out which brands were selling the most. One never knows what one can learn/interpret from any source. Good article.